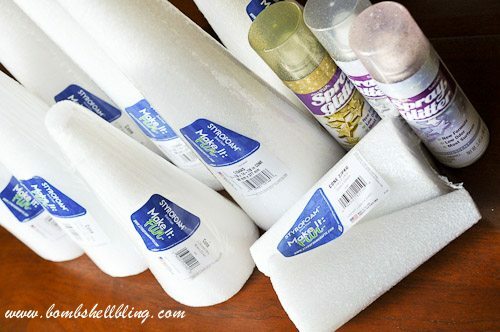 *This post is sponsored by Make It: Fun® Foam and FloraCraft. All ideas and opinions are my own. 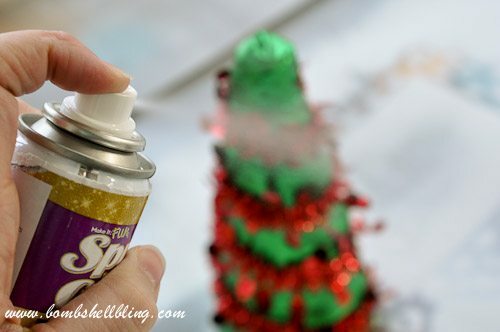 I was so excited when I got an email asking if I would like to play with Make It: Fun® Foam and a mystery item this holiday season and share my ideas with you! Of course I said “YES!” I love simple crafting ideas, as you know, and Make It: Fun® Foam forms make things very simple indeed. 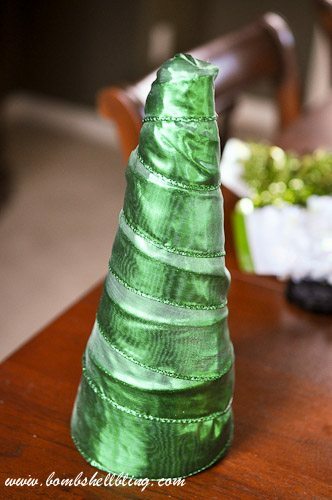 I wasn’t sure what type of foam form I would receive, but I had my fingers crossed for cones so that I could make a fun and funky display of foam trees. JACKPOT! I was pumped when I opened my box and saw not only cones, but also SPRAY GLITTER!!! Ummm….HELLO! Ms. Bombshell Bling NEEDS spray glitter!! Mama like. 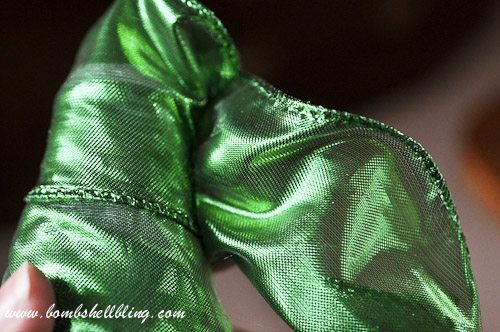 For this project I also used this green ribbon from JoAnn’s Fabrics, mini garland from Target, and a hot glue gun. As always, be careful not to burn yourself when using a glue gun! Let’s get started! Glue your ribbon end directly to the foam cone. 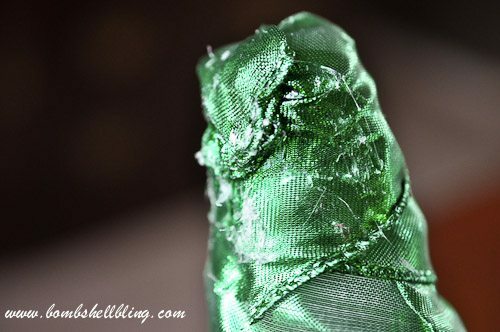 Now wrap it so it is double layered at the bottom so that the green is vibrant and not see-through. 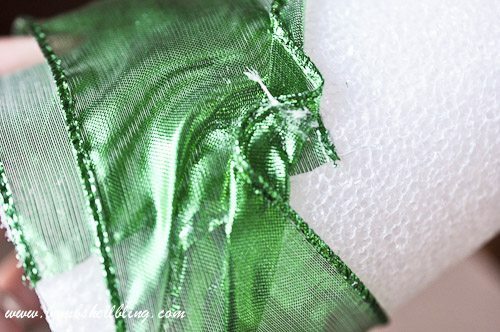 Once you have wrapped the ribbon twice around the base, secure it with more hot glue. 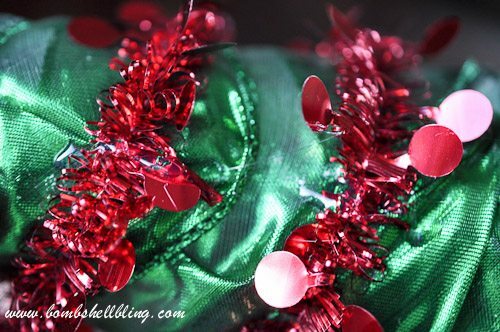 You will wrap up the cone, being sure to double up on he ribbon as much as possible. You will have the pull and tuck and fold and glue the heck out of the back so that it looks smooth from the front, as shown. Don’t worry, though, no one will be able to see the train wreck of the back from the front! Once you have wrapped up to the top glue down the ribbon and cut it off. Fold and glue down the top, as shown below. Take a look at this cone now. Pretty nice, right? But you can still tell where I couldn’t quite get the ribbon doubled up on top of itself. I am going to hide that with the mini tinsel garland. 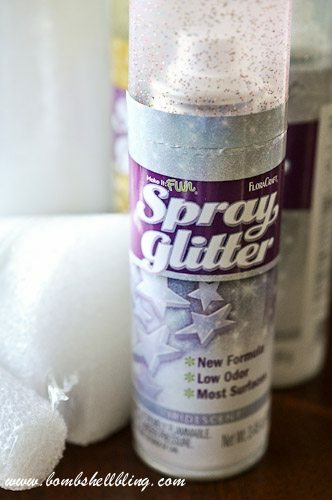 However, before we glue on the garland let’s talk GLITTER! IGNORE THE PICTURES!!! I KNOW THE GARLAND IS ALREADY GLUED ONTO THE TREE IN THIS PICTURE, BUT THAT WAS A MISTAKE! 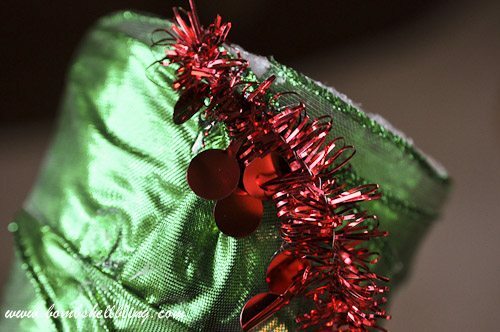 The glitter spray made the ribbon pretty but the garland dingy looking, so I ended up pulling it off and glueing a fresh one on, which made for the best of both worlds. 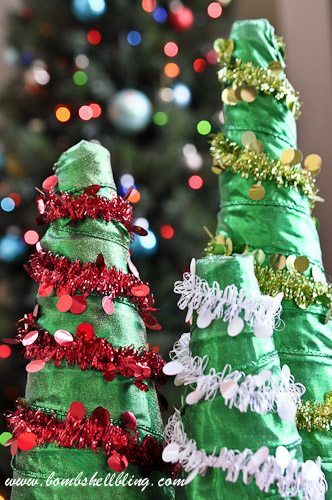 Take your ribbon wrapped cones outside, put them on a piece of cardboard, and spray the heck out of them with the glitter spray. I used the gold glitter spray. Let them dry and air out so they won’t be wet or fume-y before you bring them inside. 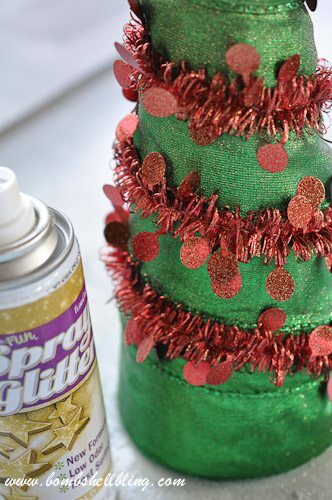 Once the glitter is completely dry, use hot glue to wrap and glue the mini-garland onto the foam trees. Once again, I glued it on the back of the cone each time it wrapped around. All done! Aren’t my foam trees festive?? My one year old keeps running up and pointing at them in glee and squealing, “TWEEEEEE!!! !” Cutest. Thank you so much to Make It: Fun® Foam for the chance to play with these fun crafty goodies! Be sure to check out the Make It: Fun® website and their sister blog, Crafts ‘n Coffee. 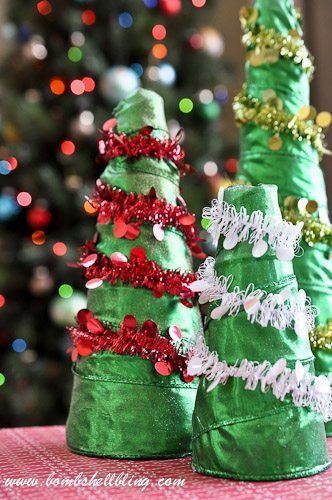 Your “Twees” are very festive! So glad you rec’d the goodie package with a little “bling” in it. Thank you! You are welcome!! Thank YOU!